When you live in Washington for long enough, the tourist appeal loses its initial flare. 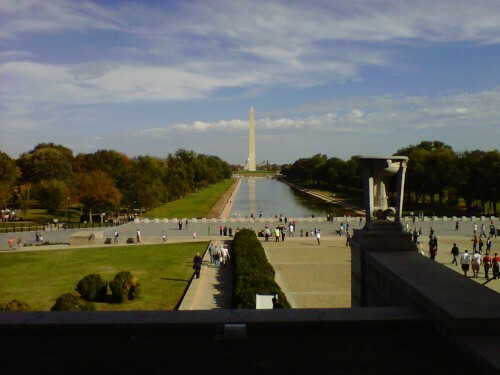 Often times, those of us who announce residency for longer than a Presidential term are left to visit historical sites, memorials, landmarks, and museums when family or friends are here from out of town … or we’ve guilt tripped ourselves into venturing out into the District’s finest attraction – the National Mall. The National Mall is an amusement park full of attractions for intellectuals, historians, and wide-eyed imaginations. The Smithsonian museums and artitectural marvels remain dominant forces on any “National Mall To-Do List.” A stop to glance at the Hope Diamond, a visit to the Apollo Lunar Module, and reveling at the site of Dorothy’s Ruby Slippers are all educational trips masked by the fact that seeing this stuff really is “cool” — and — you can see all of it one day if you really want to. But for me, the Lincoln Memorial is endowed with nostalgia. The neoclassical monument, designed by Henry Bacon, receives millions of visitors each year and remains the site of many large public gatherings and protests. Most notably, Martin Luther King, Jr. delivered his “I Have a Dream” speech at the memorial in 1963. That’s not why I love sitting on the steps of the Lincoln Memorial. At the age of 12, my dad took me on my first trip to Washington, D.C. I never would have guessed I’d be living in this city a decade later after completing a Bachelor’s degree here. The memorial still stands at the west end of the National Mall. It’s still modeled after ancient Greek temples and stands 190 feet long, 119 feet wide, and almost 100 feet high. It’s surrounded by a peristyle of 38 fluted Doric columns, one for each of the thirty six states in the Union at the time of Lincoln’s death. The 12-year-old eyes that once looked upon the gargantuous marble-made President are older now. Those peepers need glasses to assist with a strong case of being nearsighted. Their perspective has shifted a few inches toward the sky since I did grow a little between the ages of 12 and 14. But the biggest change of all has nothing to do with the memorial or my vision. Slate writer Jessica Grose recently published a piece online about de-cluttering a family home when it comes time to sell it. Clutter, closets, memorials, and memorabilia – selling the house is easy, getting rid of the “stuff” inside is not. First, there’s the inevitable “throwing away” of the spelling test, book reports, art projects, and maybe even a few science fair ribbons. Then comes the frustration. The whole, “Just throw everything out. I don’t want to deal with this anymore,” phase. When a childhood home is being sold, like mine was in February, memories from the past feel like they’re being re-routed in the mind, only to become fantastical day-dreams. 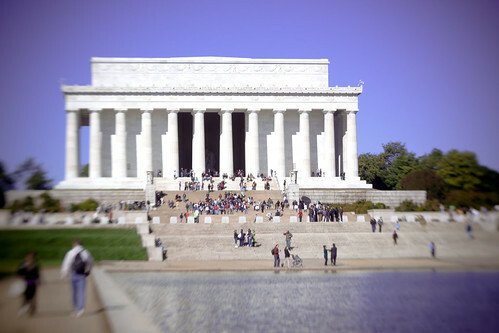 The Lincoln Memorial I visited at age 12 with my late father is an example of that. The reason the Lincoln Memorial became my favorite place to “sit and do nothing” in D.C. was because my dad took me there when I was a kid. That’s the same dad who moved our family of four (plus a dog, which later became two dogs) into our first house when I was nine. Come spring, that house will no longer be a possession that my family holds in their hands but rather a high-priority destination on the day-dream super-highway. When a person decides to call Washington, D.C. home after not being born and/or raised in the Nation’s Capital, you know there’s something special about this place. Between unethical scenarios in local politics and the WMATA’s inability to provide reliable public transportation due to a severe lack of funding, it’s easy to ruffle a resident’s feathers. I like to think people live here for a reason that they forget to remember – the history of this city and the history continually being made here makes a resident feel like they’re a part of something special, something bigger than themselves. Unlike our past Presidents, the residents do not get monuments and memorials erected in town for commendable acts. Unlike our past Presidents, residents continue their day-to-day activities by working to pay their bills and fulfilling their roles as consumers in this consumer-driven society. Much like my 12-year-old self staring upon a marble President Lincoln for the first time, we can all appreciate the fact that no matter how old we get or how physically, mentally, and spiritually run-down we are as people, the National Mall will always be a cherished American childhood memory whether we visited it then or in our later years. The moral of the story is: the Lincoln Memorial is not be my favorite place to “sit and do nothing” in D.C. as of March 2011. My favorite place to “sit and do nothing in D.C.” is my couch while riding the day-dream super-highway express-route straight to the “Age 12” ramp where my dad is waiting with a map and camera in-hand from atop the steps of Honest Abe’s Washington home. I’ve had similar thoughts over the past year, moving here from my home out West – everything you have said has resonated, though your story is not my own. Great writing. If you are interested in photography I highly recommend Washington Photo Safari’s monuments and memorials tour. It’s a different experience when you revisit these sites in that context.